The collection of reliable and comprehensive data on the magnitude, composition and distribution of a country’s population is essential in order for governments to provide services, administer effectively and guide a country’s development. The primary source of basic demographic statistics is frequently a population census, which provides hugely important data sets for policy makers, practitioners and researchers working in a wide range of different socio-demographic contexts. 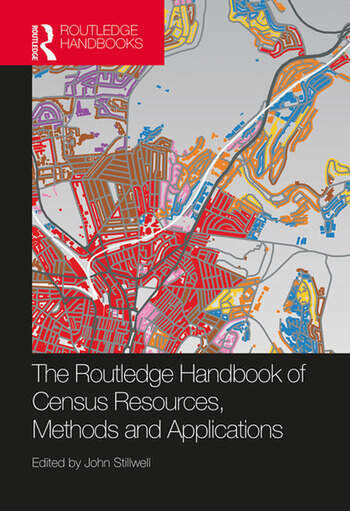 The Routledge Handbook of Census Resources, Methods and Applications provides a comprehensive and authoritative guide to the collection, processing, quality assessment and delivery of the different data products that constitute the results of the population censuses conducted across the United Kingdom in 2011. It provides those interested in using census data with an introduction to the collection, processing and quality assessment of the 2011 Census, together with guidance on the various types of data resources that are available and how they can be accessed. It demonstrates how new methods and technologies, such as interactive infographics and web-based mapping, are now being used to visualise census data in new and exciting ways. Perhaps most importantly, it presents a collection of applications of census data in different social and health science research contexts that reveal key messages about the characteristics of the UK population and the ways in which society is changing. The operation of the 2011 Census and the use of its results are set in the context of census-taking around the world and its historical development in the UK over the last 200 years. The results of the UK 2011 Census are a unique and reliable source of detailed information that are immensely important for users from a wide range of public and private sector organisations, as well as those working in Population Studies, Human Geography, Migration Studies and the Social Sciences more generally. John Stillwell is Professor of Migration and Regional Development in the School of Geography at the University of Leeds. He is Director of the UK Data Service-Census Support and has worked both on both the delivery of census data to users and its application in a research context throughout his academic career. He was the Co-ordinator of the ESRC-funded Understanding Population Trends and Processes (UPTAP) programme and has been the co-editor of Applied Spatial Analysis and Policy (ASAP) since its inception in 2008.